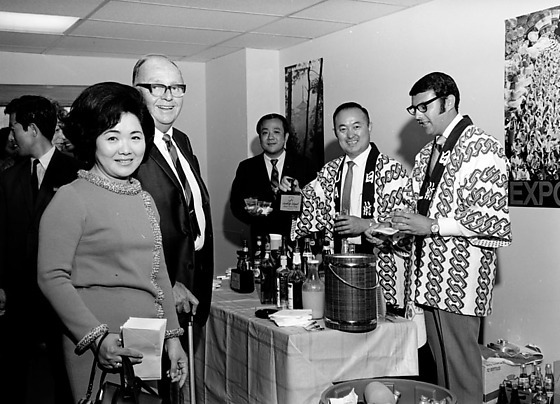 Two Caucasian and Japanese men in Japan Air Lines happi coats serve drinks to a Caucasian man and Japanese woman, California, 1970. The two bartenders stand at right behind a table covered with bottles of liquor. The couple stands at left looking at viewer; the woman holds a bunch of envelopes. A Japanese man in a suit stands in background holding two drinks in one hand. Typed on original envelope: Japan Air Line.